This month we will run a couple featured activities - see below for more details. 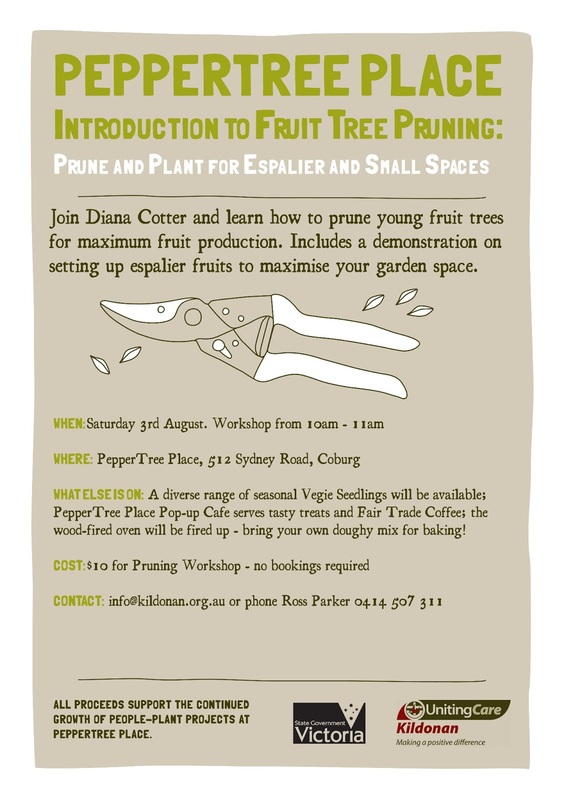 Join Diana Cotter for a hands on workshop planting and pruning espalier fruits. Workshop cost is $10 per person, no bookings required, just turn up from 10am-11am See the flyer below. Ross will have the woodfired oven roaring and you are invited to chat about bread and baking while taste-testing loaves warm in your hand. Bring your own doughy creations to the oven by 10:30amand share in the age old tradition of community baking. The Coburg Home-Grown Edibles Swap will be bursting with garden greens, glossy citrus fruits and fragrant herbs. Bring along your excess and swap & share backyard bounties with local growers from Moreland and beyond. Pop past the PepperTree Community Nursery for cheerful, flowering perennials and wrap your fingers around a pot of tea, creamy coffee and tasty treat from the Cafe Cooperative. Have you taken the time to walk through the fantastic food forest hidden in West Brunswick in Dunstan Reserve? 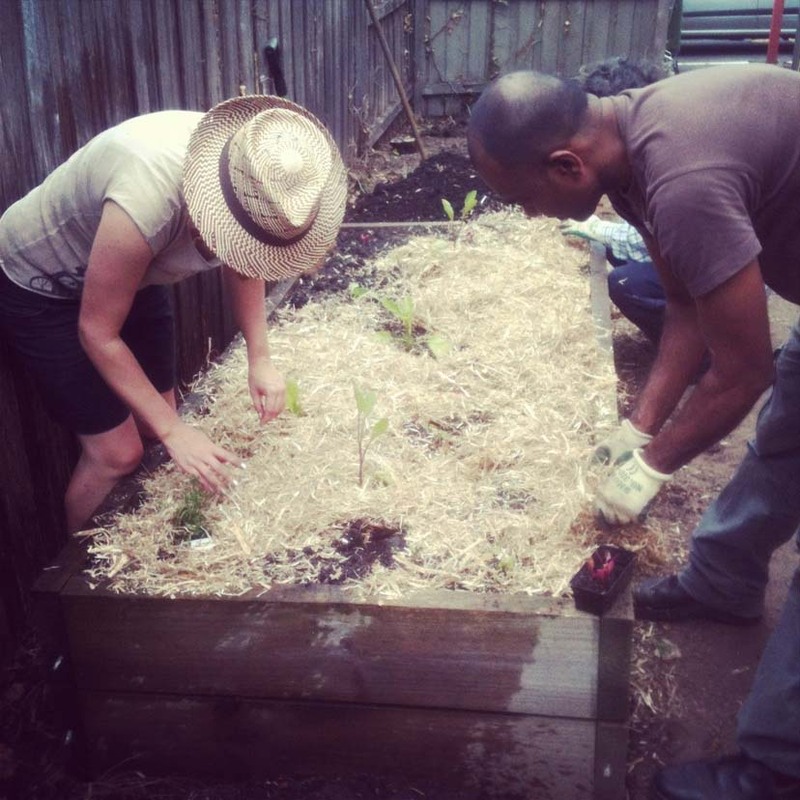 The food forest is a long term project that has the support of Moreland City Council. It's been there for more than 15 years and we have the chance to grow it into an even more amazing place for everyone to enjoy as well as a great place to learn. With the help of a seeding grant from the council, we've made a great start over the last year and we recently had a fantastic Permablitz in June that gave the area a real boost. It's looking great. 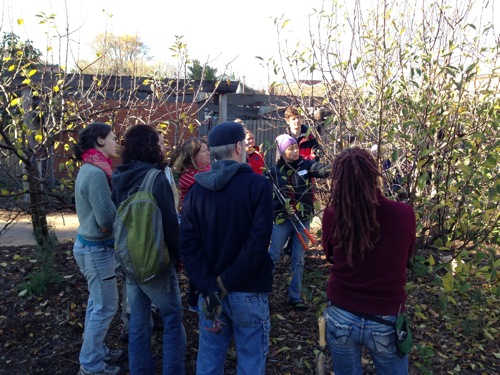 As the first part of the rejuvenation project comes to a close, we're looking for a group to help take care of things like planting, pruning, berry wrangling, soil enrichment, pest management, signage, harvesting (and eating! ), running events and workshops (and of course watering and weeding). If this sparks your imagination, send us an email at grow.eat.moreland@gmail.com and lets get together for an informal chat and a cuppa on Sunday 21st July at 11am down at the community garden so we can flesh out some ideas, roles, interests and get to know each other. Although we're obviously happy if you have relevant skills and knowledge, you don't need to have any to get involved, we have a wide range of skills to draw on and we're happy to share! If you're keen, treat this as a learning space or somewhere you can put your knowledge to good use. Where else will you have a chance to work with such a wide variety of mature trees and establish a complex, self-sustaining mini ecosystem. Earlier this year I came across a very inspiring program being piloted by the Australian Red Cross called ‘Putting Down Roots’. It teaches organic gardening to newly arrived asylum seekers in our own Moreland backyard in Melbourne, Australia. Many asylum seekers experience food insecurity from a lack of funds, as in Australia they are often not permitted to work while their case is being processed, and there may also be a lack of access to culturally appropriate food. The program was initiated to address food insecurity at the grass roots level and does so in what I think is an innovative way. For me it seems to apply permaculture principles, not just to food growing, but to the way the program is structured — it was adaptive to each individual’s needs. It wasn’t just a hand-out of food, or knowledge even, but helped develop what would be the best sustainable solution for each person — both physically in the built gardens and in connecting to the new place people have arrived at. I spoke with Kim Hutchinson, the manager of the project at Red Cross to get an incite into how the pilot was designed and the outcomes it had- including improving food security and also lessening social isolation. The full article written by Elspeth Brock is available on the Permaculture Research Institute website. MOOCs or Massive Open Online Courses are "online course[s] aimed at large-scale interactive participation and open access via the web"(Wikipedia). They're a bit of a buzzy thing right now and some people reckon they might be the future of education. Some say they're about as high on the hype cycle as they can go. The attraction is easy to understand, course material and lectures from some top tertiary institutions available on-line to everyone for free. Anyway, one of our friends has pointed out a couple of MOOCs that you might find of interest. As yet, we don't know how good these are, if you know (or try them out), please add comments. Coursera has Sustainability of Food Systems: A Global Life Cycle Perspective from the University of Minnesota which they describe as "explor[ing] the diversity of the foods we eat, the ways in which we grow, process, distribute, and prepare them, and the impacts they have upon our environment, health, and society. We will also examine the challenges and opportunities of creating a more sustainable global food system in the future." It runs for 8 weeks and requires 3-4 hrs per week. There's also Healthy Sustainable Diets from the University of Sheffield which "will identify key changes required to make our diets healthier and sustainable and considers some of the current dilemmas around eating a healthy and sustainable diet. It will examine the role of current sustainability labelling, and explores options for a multi health and sustainability label. Participants will discuss the possibilities of policy options to enable citizens to make the required shift from unhealthy and unsustainable consumption patterns." It runs for 5 weeks and requires 3-5 hrs per week.